The past meets the present at Arizona's newest resort treasure, The Westin Kierland Villas - designed to capture the modern luxury and style that is the hallmark of the Westin name. The luxurious, fully equipped vacation villas are located on 10 acres within the exclusive Kierland master-planned community, just outside of Scottsdale. Boasting more than 300 days of sunshine, the area is renowned for its breathtaking sunsets, stunning vistas, and fascinating history. Each villa offers a private balcony with breathtaking views of the spectacular Arizona landscape. Fully equipped kitchens and kitchenettes include everything necessary to prepare and enjoy a gourmet meal. A separate living room includes a queen size sofa bed, entertainment center with television, DVD player, and stereo system. The master bedroom is its own oasis, complete with whirlpool tub and of course, the Westin Heavenly Bed??. All also offer washers and dryers, and some are even equipped with fireplaces! Resort amenities include: adult swimming pool, interactive tot pool, family swimming pool, jetted spa, well-equipped WestinWORKOUT?? Powered by Reebok Gym, cabanas, grilling and picnic area, deli/marketplace, babysitting services, and a multitude of dining options. 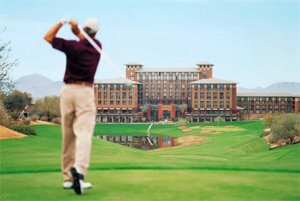 Whether relaxing at the spa or off-roading in the Sonoran Desert, shopping downtown or golfing on one of the 174 courses, there is truly something for everyone to enjoy at the Westin Kierland Villas. Special Condition This property has limited participation with the Starwood Preferred Guest program. For further details please see the Starwood Preferred Guest Terms and Conditions. Take Interstate 17 South and exit via ramp 223 (AZ-74). Take Carefree Highway to Wickenberg and turn left onto AZ-74. Continue east for 12 mils and turn right on North Scottsdale Road. Travel south for 12 miles and turn right on East Greenway Parkway. Take the first right. Take I-10 West and exit via the ramp to US-60 (Superstition Freeway). Continue northeast on US-60 and take Exit 176B (AZ-101 Loop North). Exit at Shea Boulevard and turn left. Next turn right on Scottsdale Road and turn right on East Greenway Parkway. Take US-60 West to Loop 101 North and exit at Cactus Road. Turn left onto Cactus Road. Turn right onto Scottsdale Road. Turn left onto Greenway Parkway and turn right on Clubgate Drive. The hotel is .25 miles ahead on Clubgate Drive. Take I-10 and exit at AZ-51 North/AZ-202 Loop East. Continue on AZ-51 for 12 miles and take exit 12 for Greenway Parkway. Turn left on North Clubgate Drive.